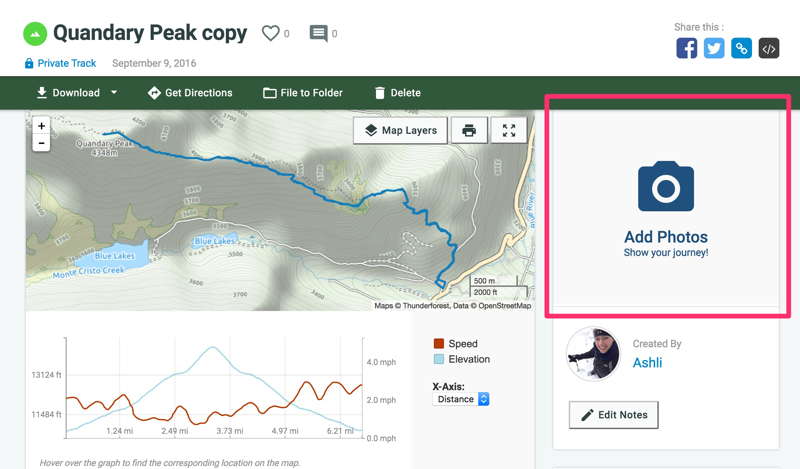 This article will show you how to add photos to your tracks, routes, and waypoints on gaiagps.com. This did not work. None of the photos from my good camera uploaded to a waypoint even though they all had a time and gps stamp. I need to be able to upload phots from my good camera (it can't run Gaia) with time and gps stamps and have them become way points! Nor can I click on the photos to turn it into a way point. VERY frustrated with Gaia's poor and non-intuitive GUI. I'm sorry your photos did not upload to the waypoint. I've also sent an email with a few troubleshooting questions so we can look into this for you. "Note: If the photos do not contain location or time data, they will be added to the start of your track"
I am trying to add a photo and have it appear at the start of a track. The photo has a time stamp, but no location data. But when uploaded, it appears at the end, rather than the beginning of the track. I believe we are working together on an issue related to adding photos to a track. Can you send me a shared link to this track that is having issues with in our email conversation so I can take a closer look? On routes that I’ve created, I have attempted to upload photos, from the website, that have the GPS coordinates already in each JPEG. Seems like only up to five photos will show up on each route. For the rest of the photos, they won’t turn to Waypoints and so they don’t show up on the route. One photo didn’t even show up in the route's folder of photos, and doesn’t seem like there is a way to link photos (from under the account Photos to a particular route), or edit much of specific photo details from the website? Another issue is that the little preview of the pictures from the "Main Map" of routes don’t show up (just shows a question mark). I'm sorry you are having an issue uploading -add- photos to your route. Can you click 'Submit a Request' above to contact the support team with a link to your route and one of the photos so we can take a closer look? Nathan, looks like it now works. I loaded in another route (same proceedure), and all of the photos loaded. Thanks.